Barrier Security Products offer a range of speed humps including Standard and Heavy Duty speed humps for a variety of applications. The SM1000HD Heavy Duty speed hump is a tough speed hump system and is available in 1m or 1/2m modules with a choice of either solid moulded rubber or fabricated steel end caps. The SM1000HD Heavy Duty speed hump is suitable for use in transport depots, factories or terminals. The speed hump has a strong chassis construction with 6mm thick floor plate and 6 bolt fixings. 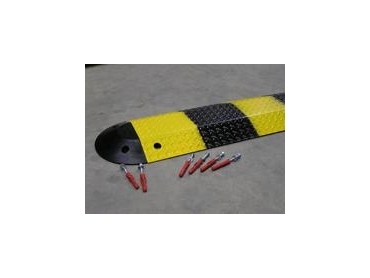 These speed humps are designed to comply with AS2890.1:2004 and supplied with all fixings. The SM1000 is a Standard Duty modular steel speed hump system and is also available in 1m or 1/2m modules with a choice of either solid moulded rubber or fabricated steel end caps. The SM1000 Standard Duty speed hump is designed to comply with AS2890.1:2004 and comes complete with all fixings. The Standard Duty speed hump is recommended for high traffic areas such as car parks, shopping centres or factory complexes. Both Heavy Duty and Standard Duty speed humps have unique underbody design and fixings, and eliminate the need for any rubber underlay, thus ensuring that they do not rattle or make noise.